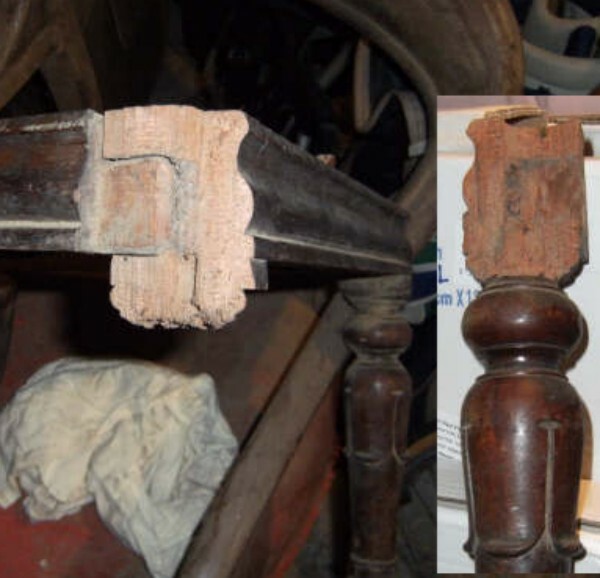 This is a very common problem and repairing broken chair leg is all part of chair restoration. 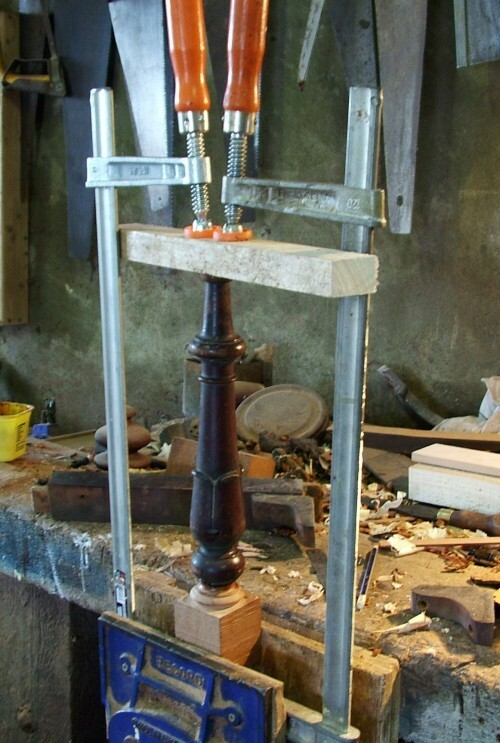 One of the front legs has broken at the seat rail mortices and the remedy is a fairly serious replacement of the mortice block – the square piece at the top of the leg. The corner brace is removed and the broken pieces of the block are removed from the front seat rail. The good part of the leg which is going to be re-used is cut off square. 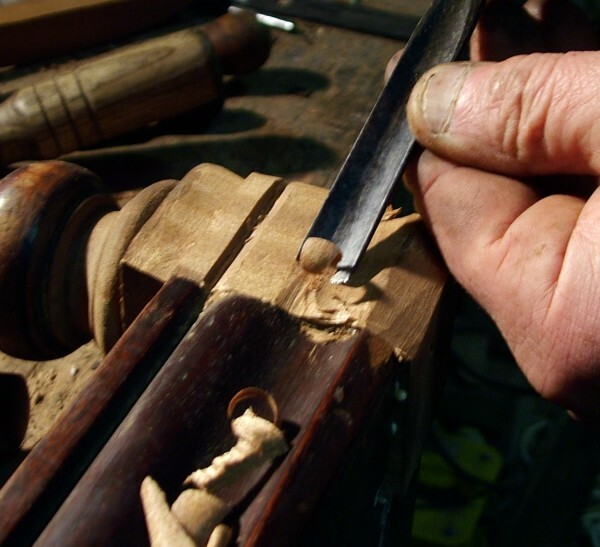 With a turned leg, I usually aim to cut the leg where a detail in the turning will minimise the appearance of the joint. The other front leg has to be removed to allow reassembly, and I can use that one as a (reverse) pattern for the new leg. 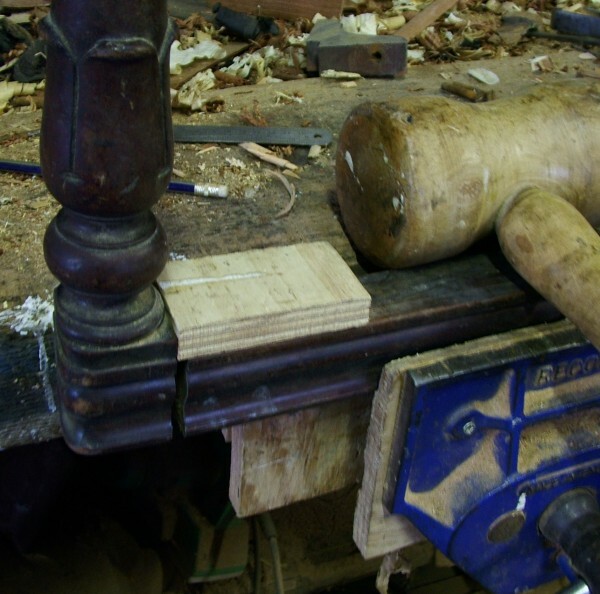 Once the glue joint is cracked, it is usually straightforward to drift the leg off the side rail using a softwood block which will protect the wood and also “aim” the impact of the mallet. Because of the extent of the damage, the new component will contain square and turned elements so I mark up a mahogany blank and put it into the lathe to turn off the detail below the square block. 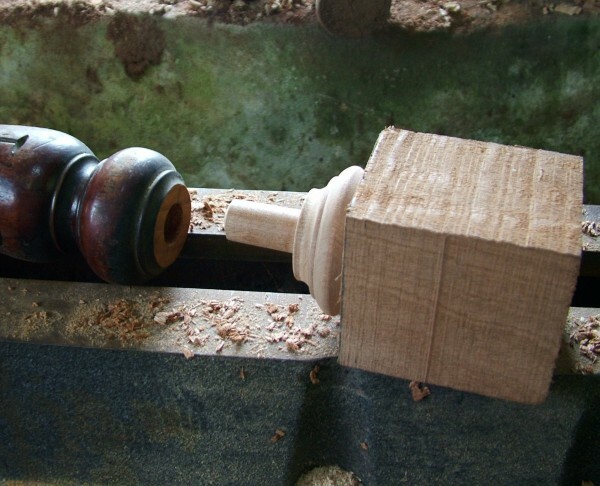 Here’s the turning finished – I have turned a ¾” spigot and I’ve also drilled a ¾” hole down the axis of the leg. It needs to be a reasonably tight fit for a minimal glue line. The two parts are glued up and clamped tight. Clamping is crucial to the success of the job and it is also important at this stage to make sure the rotation of the detail is right for the square block. 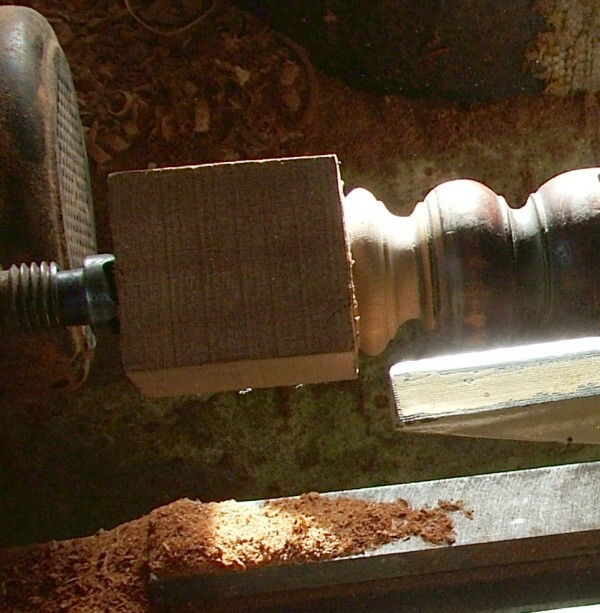 Once the glue has set, the assembly can be put back in the lathe for some fine finishing. The original centre mark is still in the block – it just needs the new piece to be blended to the original. 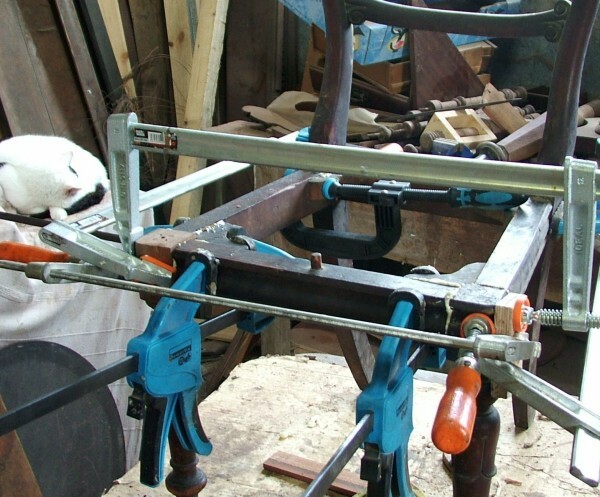 The chair frame is reassembled with the repaired leg and any loose corner braces re-glued. Again, clamping is absolutely essential. In other words, the assembly procedure here is roughly the way it might have been done originally but of course, the original maker would be very keen to get the joints tight as a matter of pride. 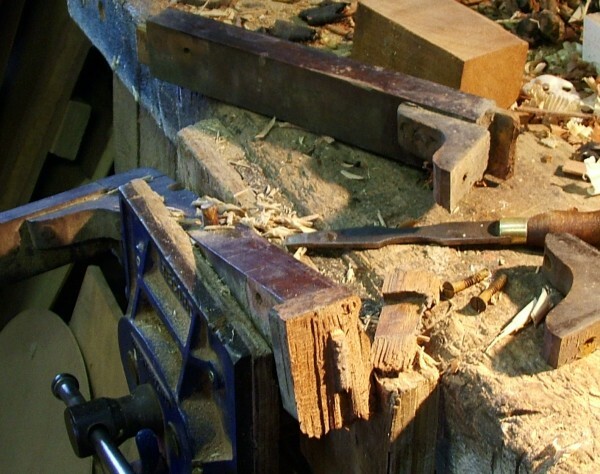 Once the glue is set, the next job is to cut the detailing in the block – in this case, there is an added complication because the profile of the side rails continues around the block to the front rail. 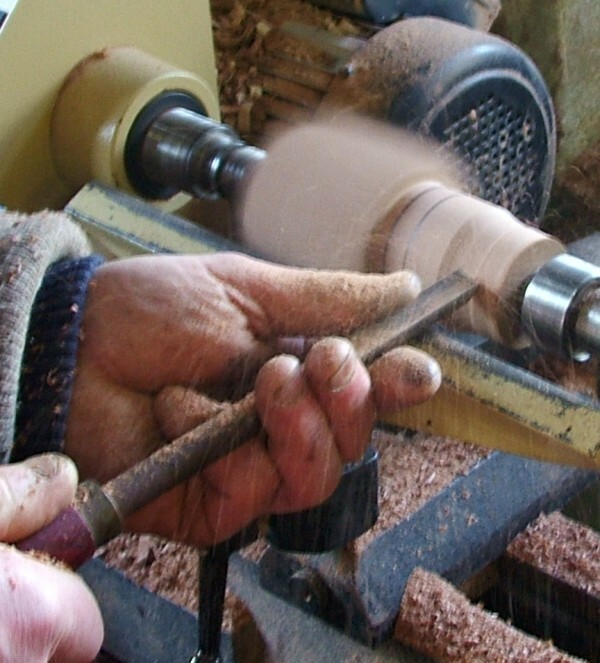 Cutting tools for this work need to be extremely sharp – ground on a fine stone and then honed with crocus powder or the equivalent on a hardwood block. Some fine sandpaper and the block is coloured to match the original. I use Bichromate of Potash, (sup-plied by TE Labs Tullow) which was traditionally used to give Mahogany that characteristic rich brown colour but it does come with many Health Warnings – otherwise, there are less noxious stains available. The chair is now ready to be returned to the customer who will clean off the wood and replace the old polish. You can learn how to do this in one of our weekend courses. 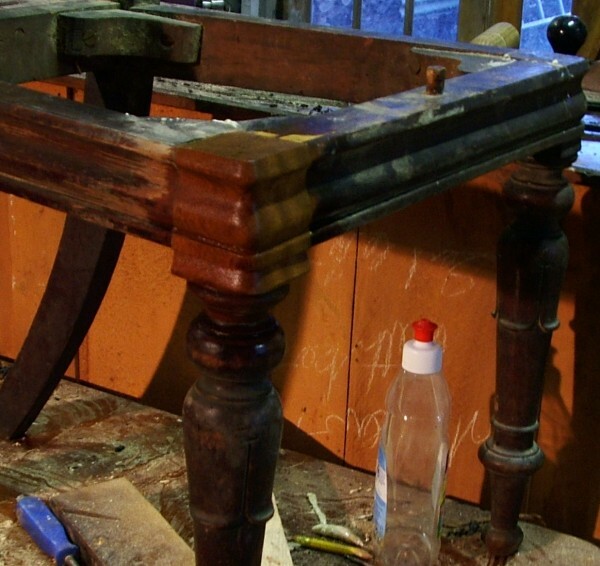 We do far more than repairing broken chair leg.